Spanish authorities have searched a former IMF chief's home and office over suspected fraud and money laundering regarding his personal wealth. Rodrigo Rato, 66, was seen being taken from his Madrid home on Thursday by officers from Spain's tax authorities. He is already being investigated for fraud over his time as chief executive of the Spanish bank, Bankia, which had to be bailed out by the government. Mr Rato served as a prominent member of Spain's Popular Party (PP). He was Spain's finance minister in the conservative government of Prime Minister Jose Maria Aznar and later a leading figure under Mr Aznar's successor Mariano Rajoy. He headed the IMF between 2004 and 2007. Mr Rato became director of Bankia in 2010, but resigned two years later amid concerns over the bank's ability to stay afloat. Prosecutors allege that company executives at Bankia misled regulators about the bank's finances. Mr Rato denies any wrongdoing. 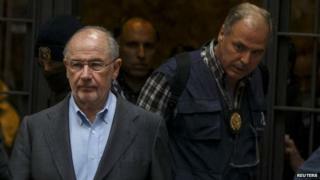 Bankia bosses including Mr Rato were also accused of widespread misuse of company credit cards under his leadership.